The Bible tells us that it was not good for the man to be alone, but it does not tell us why in this chapter. In this account of creation in Genesis 2, God created the heavens and the earth and all the animals. He created the man and brought all the creatures to the man to give than a name. God decided to make a “help meet” for him and then goes on to create the woman. One wonders though, couldn’t the man have had companions from “all the livestock, the birds in the air and the wild animals” that God had created and Adam had been giving names to, after all a dog is a man’s best friend!” Or couldn’t he have had another man or many more men created – more creatures after his own kind – to solve the problem with him being alone. Or could God not have been a companion for him? The woman must have had some special characteristics, special touch, benefit or value that she was bringing to the equation which none of the other creatures could provide! God in His wisdom decided to create a woman – as the helper suitable for him. The man on seeing the woman acknowledges that there is something different and special about her, something that makes her stand out from all the other creatures. In a marriage, the two are meant to work and build one another up towards a common goal. The woman is expected to add value to the man as a “help meet”, someone who encourages him and works with him to fulfill God’s plan for their life.The man should show guidance and help the woman to be a help meet for him. 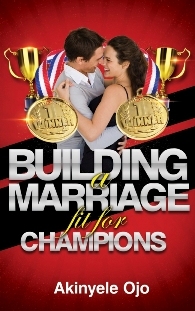 This entry was posted in Uncategorized and tagged Champions, Commitment, God, Marriage by marriageforchampions. Bookmark the permalink.